With over 70 airlines that fly in and out of New York John F. Kennedy International Airport, there are lots of layovers here. Passengers can find plenty of amenities such as restaurants, currency exchanges and nearby hotels. Famous for being the busiest airport in the country, JFK International will most likely feel small due to all the people waiting around you. Whether you need to get to a busy meeting in Manhattan or are just leaving to get back home, the hectic nature of the airport can easily be turned into a pleasant experience. 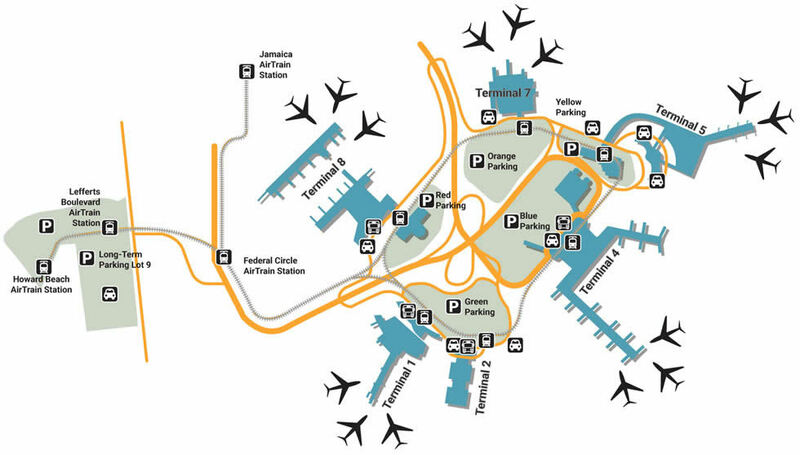 There are tons of places to park or find airport transportation at JFK, each lot offering a flat rate with locations adjacent to every terminal. If you’re heading for a flight at Terminals 1, 2, or 3, head over to the Green Lot, typically one of the busiest lots in the facility. For travelers heading to Terminals 4 and 5, the Blue or Yellow Lots are your best bet. The closest to Terminal 7 is the Orange Lot while prime parking for 8 is the Red Lot, both of which rarely surpass 50% capacity. Long-term travelers should head over to Economy parking at Lot 9, which is located at Lefferts Boulevard, four miles from the airport. From swanky lounges to minor accommodations, you’ll find everything you need at JFK. If you’re traveling on low battery, charge up at Gates 5, 7, and 8 before you take off. If you need to relieve your pet, go to the many locations, whether it’s the outdoor park at Arrivals East, North, West, and South, or the post-security convenience by Gates 31, 9, and 38. In the event that you need a quick fix because of a fall or minor medical emergency, there’s a 24-hour Nursing Suite located near Gate 12. For those that have as much time as money to spend, enjoy the shopping center at Terminal 1 or the Retail Halls located on the East and West side of the airport. Freshen up with some jazzy lipstick at the specialty Clinique/Estee Lauder store at Gate 5 or pick up a bouquet for a loved one at the Fresh Flowers kiosk (Arrivals East and West). If you’re in need of a quick pair of headphones, stop by the Best-Buy kiosks, located at Gates 2 and 10. The comfort of technology goes a long way, but not nearly as far as the heavenly sweatpants at Juicy Couture, located conveniently across Gates 3-4. From amazing restaurants that offer New York’s best to savory snacks, you’ll find endless treats by hardly looking. Grab an assortment bag at the M&Ms Store, located at Terminal 7’s Retail Hall, enjoying sweets while you wait for your flight. For something more familiar, there’s a McDonald’s and Subway located at the food court in Terminal 7 as well as a Wendy’s near Gate 62. For a unique Brooklyn lunch, stop by Aunt Butchie's Bakery Cafe, located across from Gate 14, Terminal 6.